In the Nov. 7, 2006 mid-term elections, twenty-one incumbent House Republicans lost their seats, while Democratic members emerged unscathed. Forty-two of the 55 New Members in the 110th Congress were Democrats. 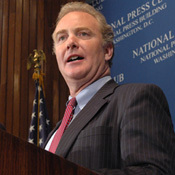 A Jan. 23, 2007 memo from DCCC chairman Chris Van Hollen stated, "Looking ahead to 2008, Democrats will remain on the offense." Democrats first worke to hold onto the seats they picked up in 2006. On Feb. 15, 2007 the DCCC announced 29 members of the "Frontline" program. According to the DCCC website the "Frontline" program "assists Democratic Members of Congress who are running in the toughest districts around the country." "This competitive program requires members to meet aggressive fundraising goals, accelerate volunteer and recruitment efforts, and increase on-line networking," the website stated. The DCCC also had a "Red to Blue" program that "highlights top Democratic campaigns across the country and offers them financial, communications, and strategic support." Supplementing "Red to Blue" the DCCC also had an "Emerging Races" program. According to the DCCC website, "In each of these races, Democratic candidates have generated excitement in their districts for their campaigns for change. As these campaigns continue to develop and demonstrate increasing strength, candidates will have an opportunity to qualify for the DCCC's Red to Blue program." The difficult economic conditions seemed to favor further Democratic gains in the House in 2008. Democrats pointed to wins in special elections in IL-14 (Hastert seat) on March 8, LA-6 (Baker seat) on May 3, and MS-1 (Wicker seat) on May 13. Twenty-six House Republicans decided not to run for re-election in 2008, compared to just six Democrats. State's Attorney Frank Kratovil, Jr.
State Sen. Andy Harris, M.D. central coast; Marion and Clackamas Cos.
MD-4 - Donna Edwards (D) elected June 17, 2008. 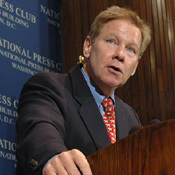 Rep. Albert Wynn (D) was defeated in the Feb. 12, 2008 primary and announced on March 27 that he would resign. LA-1 - Steve Scalise (R) elected May 3, 2008 (primaries on March 8, 2008; Republican run-off April 5). Rep. Bobby Jindal (R) elected Governor. CA-12 - Jackie Speier (D) elected April 8, 2008. Rep. Tom Lantos (D-12) died on Feb. 11, 2008; he had announced in January that he would not seek re-election. IN -7 - Andre Carson elected March 11, 2008 (ran again in the May 6, 2008 primary). Rep. Julia Carson (D) died on Dec. 15. 2007. VA-1 - Rob Wittman (R) elected on Dec. 11, 2007. Rep. Jo Ann Davis (R) died on Oct. 6, 2007. OH-5 - Bob Latta (R) elected Dec. 11, 2007 (Nov. 6 primary). Rep Paul Gillmor (R) died on Sept. 4, 2007. MA-5 - Niki Tsongas elected Oct. 16, 2007. Rep. Marty Meehan left office effective July 1, 2007 to become chancellor of the Univ. of Mass. at Lowell. CA-37 - Laura Richardson (D) elected Aug. 21, 2007 (primary June 26). Rep. Juanita Millender-McDonald (D) died on April 22, 2007. GA-10 - Paul Broun (R) elected July 17, 2007 runoff (June 19). Rep. Charlie Norwood (R) died in Feb. 2007.